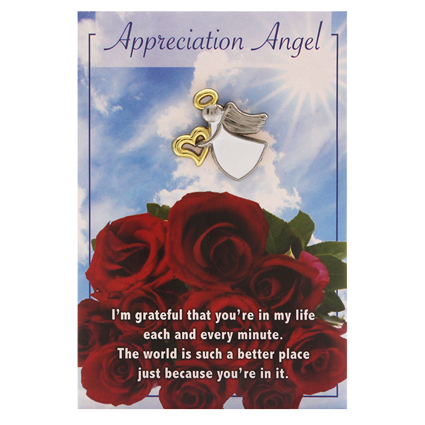 Appreciation Guardian angel lapel pin holding gold heart with silver and gold accents. Lapel pin measures 1 inch tall and comes carded with a sentiment. 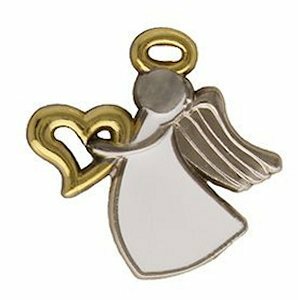 Angels are always a special addition to anyone's outfit especially when it expresses the perfect sentiment for the wearer. A thoughtful gift idea focusing on sentiments and occupations that say so much. This appreciation angel says thank you again and again to the wearer who knows you appreciate him/her because they are an angel! I appreciate your prompt service and delivery.